The history of the Peace Symbol began in the mid 20th century when the world trembled in fear. For the first time in human history we realized we could literally destroy the world by aggressively and uncompromisingly enforce an ideology down the throats of another population. Bertrand Russell (1872-1970), a philosopher, historian, mathematician, and a member of the DACANW, supported Holtom and made the image’s first public appearance in the United Kingdom during the 1958 Easter weekend Direct Action Committee anti-nuclear march from London to Aldermaston. He wrote: “It was invented by a member of our movement (Gerald Holtom) as the badge of the Direct Action Committee against Nuclear War, for the 1958 Aldermaston peace walk in England. It was designed from the naval code of semaphore, and the symbol represents the code letters for ND.’” The code ND for Nuclear Disarmament. The circle, representing the concept of total or complete, surrounds the N and D signifying total or complete nuclear disarmament. Ken Kolsbun, (author of the book Peace: The Biography of a Symbol), said Holtom expressed regret in not designing the peace symbol with the joyful lifting of arms towards the sky; Holtom’s wish that the peace symbol connotation of despair be changed to joy, when the peace symbol is inverted the letter “N” becomes the semaphore code for “U” which could mean “universal” disarmament or the less popular but courageous “unilateral” disarmament. In the Elder Futhark, this reversed peace symbol is also that of “Protection” or Algiz. The symbol has been corrupted during the sixties when the “establishment” accused the bearers of the symbol as “anti-American” and cowards. When designing this ring I included teardrops on the sides, each forming peace signs representing the Trail of Tears, an act of genocide by our government and it’s interests: the removal included many members of the Cherokee, Muscogee (Creek), Seminole, and Choctaw nations among others, from their homelands to “Indian Territory”. Originated from a description of the removal of the Choctaw Nation in 1831, many Native Americans suffered from exposure, disease and starvation en route to their destinations. Many died, including 4,000 of the 15,000 relocated Cherokee. By including the tears we recall the price of inhumane decisions and turn to compassion as our guide in the future. This ring represents the concept, ideals and cost of Peace Making and commitment to making the future a better time to live and grow: shedding corruption, turning away from abuse and despite; creating a better way to live and love each other and never forgetting the cost of conflict. 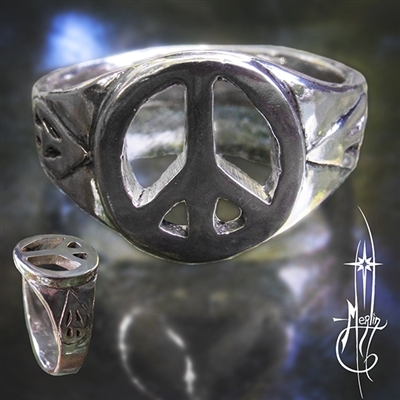 To purchase yours, please visit my Peace Ring Page.